Seat belts are vehicle safety device used to secure the occupants of a vehicle against harmful movement that may result during a collision or a sudden stop. 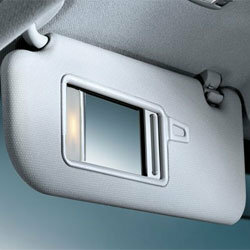 They also ensure that the occupants are secured in the right place, for airbags to be more effective when deployed. The first step automobile manufacturers look at is to check whether a passenger is seated at a particular location, and then check if the seat belts have be secured. For this, a reed switch and a magnet under the seat is used, and when a passenger is seated, the magnet moves closer to the reed switch and signals the microprocessor. This ensures that the seat belt warnings are issued only where passengers are seated. The next step is to check whether the passenger has actually secured the seat belts so the alarm can be disabled. Vane sensors, which consist of a reed switch and magnet secured at a fixed distance to keep them actuated, are fitted inside the seatbelt holster. When the seat belt lock is inserted, and it comes between the reed switch and the magnet, the magnet’s field is shunted away and the reed switch opens. Suitable products: MO-1422 and MC-1425 closed differential reed switches with cropped leads, in vane sensors.